Very windy with falling temperatures. Mostly sunny, highs near 50. Unseasonably mild weather continues across the region today as a warm front pushes north across New England. Rain along with some scattered thunderstorms will impact the region throughout the day into the evening with high temperatures maxing out near 60 degrees south and mid to upper 50s north. A few locations across southern Massachusetts and Rhode Island may break previously-set high temperature records. Scattered showers pop up across New England later this morning before a wave of heavier precipitation moves through during the midday into the early afternoon. 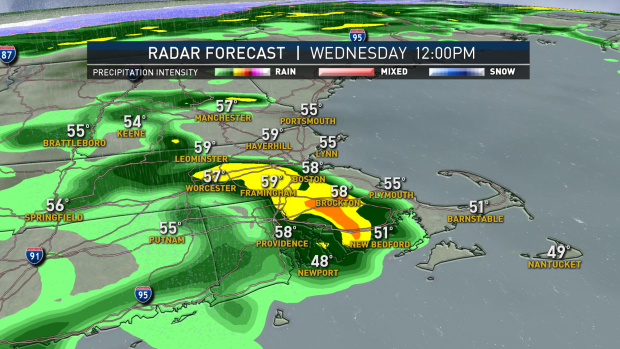 Scattered showers, some heavy, continue into the evening. Some heavier bands of rain may impact the evening commute with wet roads and low visibilities. Cloudy and humid conditions continue overnight. The next wave of heavy rain will move through during the early morning hours, lows remaining in the 40s south to mid to upper 20s north. Temperatures fall back toward more seasonable tomorrow as a cold front pushes through the area during the early morning hours. 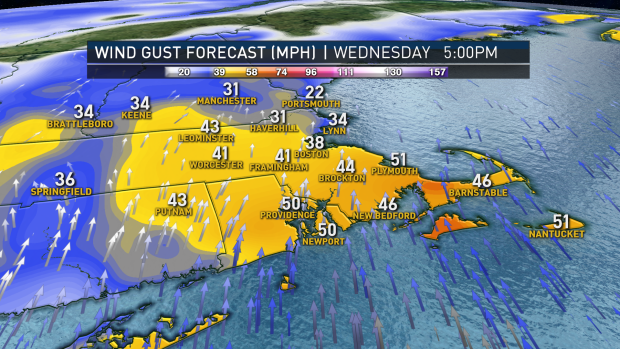 Gusty winds pick up after the cold frontal passage with much cooler air spilling south across New England. Winds may gust up to 40 to 50 mph. Aside from a few fair weather clouds, will see mostly sunny skies with highs a bit cooler in the 40s, 30s north. All eyes turn to a fast-moving wave of low pressure sweeping across the Mid-Atlantic region on Friday. Expecting this storm to stay well south of New England along with its precipitation shield but, a jog north in the storm track would bring potential snows to southern New England. Highs on Friday will range from the mid 30s to low 40s. Another shot of cold air moves in on Saturday with dry weather expected. Highs remain in the upper 20s south and mid teens to the north across the region. Pleasant weather is on tap for Sunday with a high pressure system cresting overhead. Moderating temperatures and more chances for rain and perhaps some snow are in the forecast for the start of next week.